This is one of my favorite, and easy to find, salads in France. Many restaurants and brasseries have it on their menu and, as the name implies, there will always be lettuce and warm goat cheese. The rest of the garnitures will vary depending on the restaurant, and the season. Unless its specified as an entrée, this salad is usually copious enough to eat on it’s own, especially at lunchtime or on a warm summer evening. I first discovered the salade de chèvre chaud in Paris at Le Comptoir du 7ème (39, avenue de la Motte Piquet, 75007) a bistro at the metro stop Ecole militaire, right near the Eiffel Tower. Since 2001 it’s been my all-time favorite spot for this salad. The goat cheese, and a fresh tomato slice, are wrapped in a thin layer of pastry and accompanied with a variety of seasonal vegetables- perfectly satisfying. Salade de chèvre chaud is also one of the first French specialties I learned to recreate. Here’s my version (for 2 people), easy and tasty! In a bowl, combine the mustard and vinegar. Then steadily stir in the olive oil. You can also add freshly chopped garlic or shallots. This recipe makes a lot of dressing that keeps well in the fridge. 2. 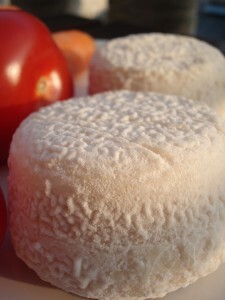 Slice the goat cheese into 4 half-inch rounds and place on baking sheet. 3. Sprinkle with olive oil, a little pepper and a few chili flakes. 4. Bake until the cheese is warm and slightly turning brown (but not melted!). 5. Place cheese on prepared toasts. 6. Decorate salad with your favorite ingredients and dressing. This entry was posted in Recipes (All) and tagged cheese, restaurants, salads. Bookmark the permalink.